Cabarete is a coastal haven on the north coast of Hispaniola, the island that the Dominican Republic shares with Haiti. Although it first gained attention as one of the world’s premier spots for kiteboarding and windsurfing, Cabarete has much more to offer visitors and expats. Year-round warm weather, a lower cost of living, friendly locals, a fun lifestyle and tropical beaches all make Cabarete worth checking out. Cabarete is a laidback and relaxed town. And even though it is popular with tourists, you get a small-town vibe thanks to the small but tight-knit expat community where everybody knows everybody. And there are plenty of fundraisers, events, and parties every week. 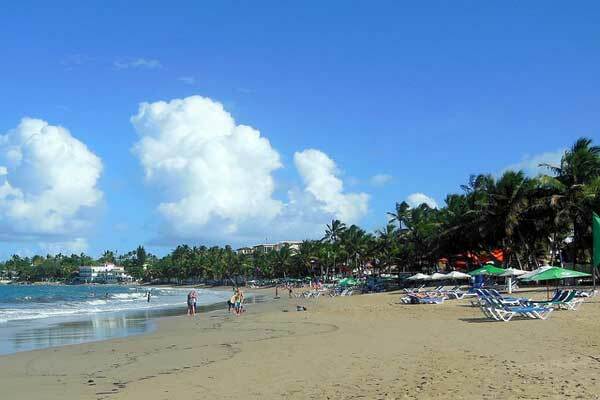 Cabarete is near North America, which has made it popular with U.S. vacationers, as well as Canadian snowbirds. In the winter season, the town is noticeably busier and if you plan to come at that time of year, it’s best to reserve a rental early. With frequent direct—and relatively short—flights from cities in the U.S. and Canada, it’s easy and cheap to get to the D.R. The closest airports to Cabarete are in Puerto Plata, or Santiago de Los Caballeros where flights tend to be cheaper. Cabarete has one long main thoroughfare through the heart of town, with condos, shops, and restaurants on either side. The whole town is walkable, although there are motoconchos (motorcycle taxis) ready to zip you around town if you’re in a hurry to get somewhere (but why would you be?). The population is about 15,000, although you will find the larger town of Sosua with a 50,000 population just a few miles to the west. The second largest city in the Dominican Republic, Santiago de Los Caballeros, with almost a million people in the metro area, is about two hours away. In Cabarete, the action is on the beach. Each afternoon the winds pick up and the bay comes alive with sails and kites. The side-onshore winds make it easy to head out straight from shore and then come right back. If you are a wind sports veteran, you can bring your own gear or rent at affordable prices at one of the many shops and outfitters. The scene in Cabarete draws enthusiasts across the globe, giving Cabarete a distinctly international vibe; it’s not uncommon to hear a half-dozen languages spoken just walking through town. As you can imagine, these same spots offer lessons, starting at beginner level and you’ll find people of all ages out on the water. 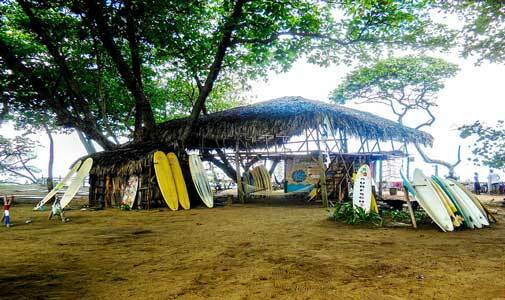 But you don’t have to be into kiteboarding to enjoy life in Cabarete. There’s a lot happening on shore too. You can take miles-long walks on the beach, where the development of town gives way to wild beaches. There are many yoga classes and alternative healers. Cabarete also enjoys good healthcare, conveniences like high-speed internet, and reliable cellphone service. There’s also an active live music scene here too, with talented locals and expats playing acoustic guitar and singing and playing in bands from jazz to rock to country. And if you like to dance, there are salsa and bachata. Many expats are involved in local volunteer organizations, helping the area’s less fortunate residents and with animal rescue. A “night market” every Sunday evening at a beachfront restaurant brings local and expats artists, artisans, and food producers together to sell their wares. There are no large resorts or condo/hotel towers in Cabarete, so the skyline fronting the beach is low buildings and palm trees. No glitz and glamour here. Just a chilled outlook and attitude. If you’ve been to the major resort areas of the Dominican Republic, like the all-inclusive-filled Punta Cana, this is a whole different world. On the sand are a long row of beach bars and restaurants offering up live music, seafood, and other cuisine. A cold Presidente costs $3 a bottle, happy hour mojitos are $4, and you can never go wrong with a Cuba Libre (rum and coke), which is the DR’s national drink. Many places stay open serving food late into the night…some turn into lively nightclubs. Most places have tables in the sand…and the best way to get from place to place is on the beach. The cost of living in Cabarete makes living in a bustling beach town, even one popular with tourists, affordable. A retired couple can live comfortably, with plenty of fun activities, for around $2,500 a month, all in. A meal in a restaurant will run you under $20 for two people. Well-stocked grocery stores mean you can get imported products for about the same price as you would pay in the U.S. and you can get fresh fruits and vegetables for pennies on the dollar. The Dominican Republic has a very active agricultural sector, including a large highlands area that grows “cold weather” produce. Expect to get a week’s supply of tropical fruits like mangoes and papayas, as well as broccoli and apples for well under $10 at a produce stand. On the real estate side, you can find rentals for $400 and up for a one-bedroom home within walking distance of the beach, making it affordable to “try before you buy.” The best rental deals can be found on the Facebook group for the Cabarete expat community or through in-person networking. Condos are the way to go in Cabarete, and you can get a two-bedroom condo near the beach for around $90,000. With so many vacationers and part-timer residents looking for rentals, a promising investment worth exploring is to buy a property for short-term or long-term rental. You could see significant returns, especially in high season. “I came here on vacation and quickly realized this is where I needed to be,” says Kathy Pow. She lives in Cabarete, a small beach town on the Dominican Republic’s north coast. With two international airports nearby, in Puerto Plata and Santiago de los Caballeros, it’s fairly easy to get to and from North America, with many direct flights from the major cities there. Cabarete first gained fame as one of the best places in the world for kiteboarding and windsurfing thanks to steady trade winds that pick up in the afternoon. But there’s a lot more to Cabarete. There are expats of every age and background, from ambitious small-business owners to relaxed retirees. There’s a laidback vibe. Everybody has the same uniform of shorts, t-shirt or tank top, and sandals. The beach runs on the long, graceful curve of Cabarete Bay. 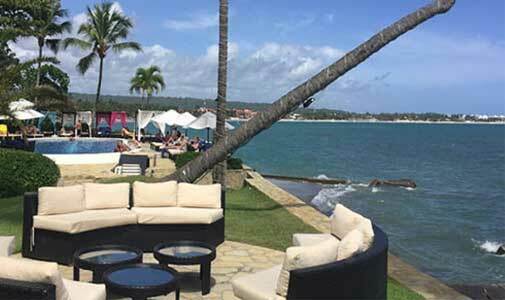 On the east side is a cluster of open-air bars and restaurants, with tables right on the sand. If you’d prefer to lay back in a lounger on the beach, with an umbrella…servers will come to you. Either way it’s the perfect way to spend an afternoon. The beach at Cabarete is a popular place to while away sunny days. Kathy first visited this stretch of the Dominican Republic’s north coast eight years ago. She kept coming back, a week here and a week there, then months at a time, before moving down full-time three years ago as a retiree. As with many from northern latitudes, Kathy found Cabarete’s climate a big draw. It’s warm every day, the heat tempered by the sea breezes. “The weather was a big reason. Winters in Canada last six months,” says Kathy, who’s from Perth, Ontario, near Ottawa. For this retired hospital administrator, a relaxed life on a Caribbean beach is just what the doctor ordered. One recent Sunday afternoon found her relaxing at a local expat hangout, Los Gringos. It’s an informal weekly meet-up, at which veteran Cabarete residents and newcomers can get to know each other. And the ones who have been here for years tell the newbies the lay of the land. Cabarete is one of those towns where everybody knows everybody. Later that night there was live music at Voy Voy, a popular beach bar, with friends. Open mic night draws a very talented group of locals and expats, who come together to play everything from country to jazz to rock to bachata, the predominant Dominican style of music known for its love songs. “I am here on my own, but I find it very safe. The locals are happy to have us here. You can make friends. It’s a good community of locals and expats. And there’s so much to do. There are still restaurants I haven’t tried,” says Kathy. There is a wide variety of housing options too. You can find rental homes and condos from $300 to $3,000 a month, says Kathy, who usually rents. She says you won’t find the best deals online but rather by asking around. In the summer she housesits a luxurious villa for friends who leave town. Not a bad gig.